Do you feel you don't have time to get involved in people's lives? Or, perhaps you don't want to come across as interfering or controlling. Maybe you think that in order to make people feel accepted, you need to back off and not confront unholy living. First, it is not alright if people mess up despite God's grace and willingness to forgive. A leader's doctrinal beliefs about grace could be at the root of a hands-off approach. If God will forgive people because of His grace if they mess up, then the leader doesn't have to concern himself as much with discipling people toward holiness. Everything will be alright in the end. So, people are left to figure out how to get back on track on their own. Most of the leader's time can then be spent in management of tasks and programs rather than in guiding people to become the Church God intends her to be. God, however, takes a different view toward grace. Though He will forgive, how we live does matter. He "saved us and called us to a holy life -- not because of anything we have done but because of his own purpose and grace. This grace was given us in Christ Jesus before the beginning of time" (2 Tim. 1:9). Second, church leaders' biblical responsibilities cannot be interpreted as a hands-off approach. Elders are told to "be shepherds of God's flock that is under your care, serving as overseers" yet "not lording it over those entrusted to you, but being examples to the flock" (1 Pet. 5:1-3). Shepherding and providing oversight of those under your care requires involvement. Rather than a hands-off approach, leaders need to take a hands-toward-God approach wherein they actively guide the "sheep" toward the Chief Shepherd, seeking to keep them out of harms way and providing nourishment along the way. 1 Timothy 3 provides qualifications for overseers, or leaders, in the church. Managing one's own family well is a criteria for "If anyone does not know how to manage his own family, how can he take care of God's church?" (1 Tim. 3:5) Properly taking care of one's family involves guiding children toward righteousness. Parents who do not actively get involved in their children's lives can expect that their children will get into trouble. This is not acceptable as God gives parents the responsibility to nurture, admonish, train, and guide their children in the ways of the Lord (Eph. 6:1-4; Deut. 6:5-9). Church leaders have that same kind of responsibility with those they lead. A hands-off approach is not biblical. Like sheep, we people can easily lose our way. 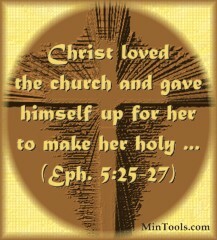 Though as Christians we have the Holy Spirit living within us, we still have our human nature. Consequently, we struggle to do what we know is right. We will sometimes yield to temptation. God's intent is that we help each other, not take a hands-off approach. The Apostle Paul "urged" the Roman church "in view of God's mercy, to offer your bodies as living sacrifices, holy and pleasing to God -- this is your spiritual act of worship" (Rom. 12:1). The word "urge" is parakaleo which means to call to one's side. Paul's example, as a church leader, suggests getting involved, not being detached. The Apostle Paul instructed those he led "how to live in order to please God" and then later reinforced that instruction -- "Now we ask you and urge you in the Lord Jesus to do this more and more" (1 Thess. 4:1). People need reminders as Paul told the Thessalonians, "It is God's will that you should be sanctified" (1 Thess. 4:3) ... "For God did not call us to be impure, but to live a holy life" (1 Thess. 4:7). God desires to use church leaders in the process of presenting His Church "as a radiant Church, without stain or wrinkle or any other blemish, but holy and blameless" (Eph. 5:25-27). Don't you want to work in cooperation with His heart for the Church? Perhaps a refresher on the effects of sin on a holy God will help.